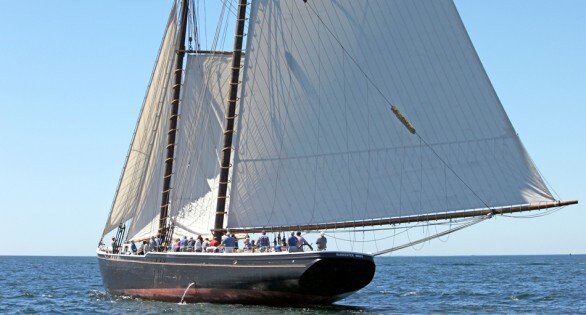 This past summer, The Gloucester Adventure Inc. was notified that it had been awarded a $40,000 Massachusetts Cultural Facilities Fund Grant for the restoration of Adventure’s historic Fo’c’sle and Galley. This grant required a 1:1 match therefore giving us $80,000 towards this project. These spaces are a requirement of the Coast Guard in order for the vessel to get certified as a Sub-chapter ‘T’ Vessel, a commercial passenger vessel. The funds were put to immediate work as Geoff Deckebach, Adventure’s lead shipwright and manager of the restoration project, set about assembling a team of shipwrights and systems experts to undertake this task. Simultaneous with the Fo’c’sle and Galley restoration, the Coast Guard also required all of the vessel’s systems be fully operational prior to certification including potable water, tankage for grey and black water, piping for pumping bilges and fire protection, AC and DC electronics and complete navigation/communication systems. Prior to implementing the work phase, Geoff and Executive Director John Fuller researched similar vessels to compare their fo’c’sles and galleys to Adventure’s, based on images in our archives. The Essex Ship Building Museum invited us to board the Evelina M. Goulart that is in a cradle on land given her precarious condition. Harold Burnham, 11th generation shipbuilder and designer, took us aboard the Goulart where Geoff was able to measure and make sketches of her intact bunks and galley cabinets. John visited the L.A.Dunton at Mystic Seaport and took extensive photos to further inform our approach to Adventure’s restoration. We then set about preparing designs for the project that was implemented by the team of shipwrights hired for the task at hand. Utilizing means and methods of shipbuilders in Essex, Massachusetts around the time Adventure was built (1926), the Fo’c’sle and Galley were restored to represent what Adventure would have looked like when she was new.